A real staple in Los Angeles, I have been coming to California Pizza Kitchen since I was a teenager, but this is a new brand of California Pizza Kitchen, much more gourmet and health conscious. Everything is Delectable, sustainable, wonderful. All that you remember, but with a new spin on healthier options with still amazing goodness. I was very pleasantly surprised. 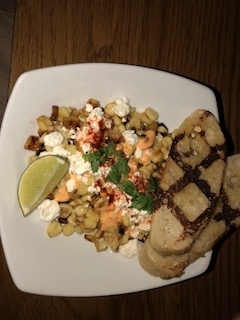 Mexican Street Corn with creamy sweet corn removed from the cob and roasted with smoked paprika, Feta and Parmesan. Served with fresh cilantro, lime and housemade ranchito sauce. I just love corn, the fresher and sweeter is what its all about for me. The marriage of the cheese and seasonings worked, a terrific starter. 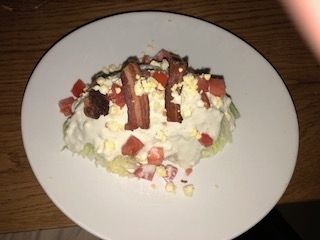 Petite Wedge, topped with bleu cheese dressing, Nueske’s applewood smoked bacon, chopped egg and Roma tomatoes. Even though it is petite for me it was a half of a pristine iceberg lettuce. The bacon was the best part. 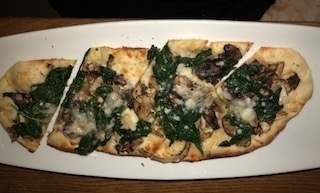 Shaved Mushroom on Spinach Flatbread, with cremini mushrooms, sautéed spinach and California Olive Ranch extra virgin olive oil with Romano and Parmesan. A nice super crispy crust and the toppings were just delightful. Crispy man N Cheese, classic mac ‘n’ cheese lightly fried with panko, served on creamy cheese sauce. 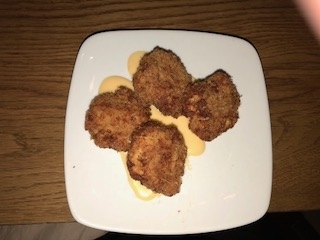 Little bites of heaven, loved these crispy darlings. 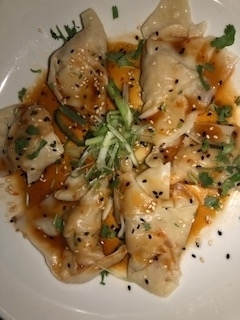 Szechwan Chicken Dumplings, Chinese dumplings topped with fresh cilantro, sesame seeds and scallions. Served with our soy-ginger chili sauce. These were one of my favorite dishes of the night. The dumpling itself is soft and succulent, pretty much everything you would want from a delicate dumpling. Avocado Club Egg Rolls, hand-wrapped crispy wonton rolls filled with avocado, chicken, tomato, Monterey Jack and Nueske’s applewood smoked bacon. Served with housemade ranchito sauce and herb ranch. 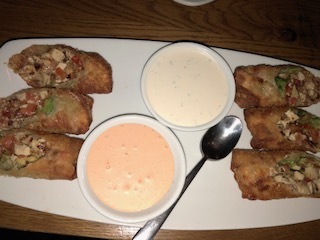 I loved these egg rolls and would order them everytime I go to CPK in the future. 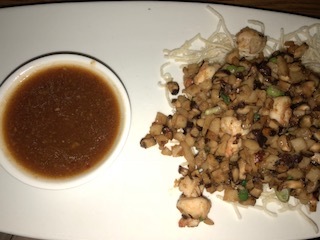 Lettuce Wraps, Fresh Shitake mushrooms, water chestnuts and scallions tossed in spicy ginger soy sauce, with Chicken and Shrimp. Another one of my favorite food items, especially the cubed Shitake mushrooms, they really make these lettuce cups. 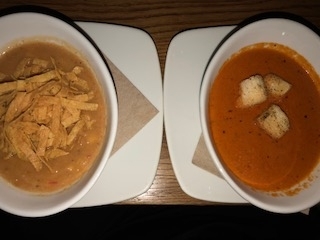 Tomato Basil Bisque, velvety tomato bisque with a touch of cream, topped with housemade garlic butter croutons. Nice tomatoe flavor and the butter croutons were just out of this world. Dakota Smashed Pea and Barley, a hearty split pea soup with barley, carrots, onions, savory herbs and scallions. Out of the four soups that I tried, this one for me was the best. Super rich pea flavor added to my overall enjoyment, a real keeper. Sedona Tortilla, with Vine-ripened tomatoes, tomatillos and corn with mild green chilies, Southwestern spices and crispy corn tortillas. Exactly what you would want from a tortilla soup; with the crispy tortillas on top, this was the added bonus. Baled Potato, Purée of potato with Nueske’s applewood smoked bacon and scallions. 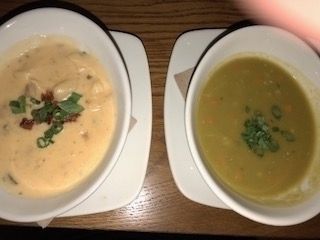 A nice soup, very rich, but I would order the pea instead. 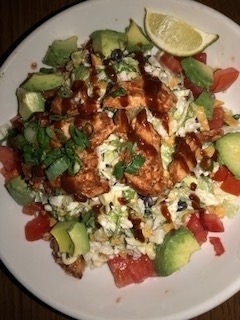 The Original, BBQ Chicken Chopped salad, with Black beans, sweet corn, jicama, fresh cilantro & basil, crispy corn tortilla strips, Monterey Jack and our housemade herb ranch. 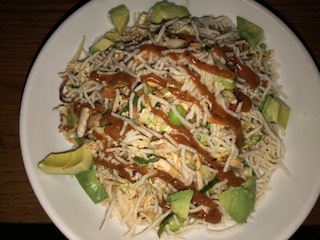 Topped with BBQ chicken, tomatoes and scallions, and fresh avocado. This has been a staple for me at CPK and it is just as great as always. Thai Crunch with Crisp veggies and fresh cilantro with chicken and the crunch of peanuts, wontons and rice sticks, tossed in Thai peanut dressing. Another one of my favorite menu items of the night, just loved the dressing. Fire-Grilled Ribeye: 12 oz. 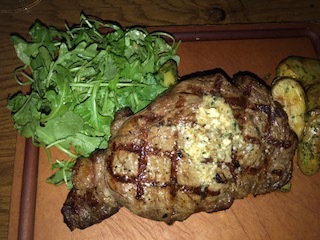 USDA choice ribeye grilled with housemade Pinot Noir, sea salt and topped with bleu cheese compound butter. Served with roasted fingerling potatoes and lemon-garlic wild arugula salad. My mistake by not ordering this steak on the rare side so I will have to come back and try it again, it was too well done for my taste. Cedar Plank Salmon, North Atlantic salmon roasted on a cedar plank in their hearth oven with smoked paprika and lime. 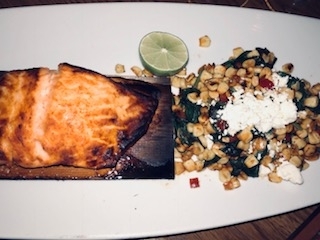 Served with white corn & spinach succotash, topped with Feta. This is a terrific version of a Cedar Planked Salmon. West Coast Burger The WCB, signature blend of Wagu, Chuck, and Brisket topped with melted American cheese, Nueske’s applewood smoked bacon, caramelized onions, tomato, pickles, lettuce, and homemade burger sauce, served with crispy potatoes. Ok hands down the best burger ever, loved the smoked bacon. 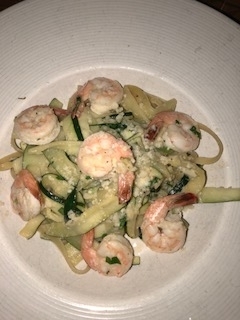 Shrimp Scampi Zucchini, a lighter spin on a traditional recipe. Zucchini ribbons sautéed with lemon, garlic and white wine, tossed with fresh Italian parsley, Parmesan and a touch of fettuccine. So much garlic you will be swimming in garlic for the rest of your evening, if that is something that you like then by all means order this very yummy dish. If you plan on having a kissing session with your significant other, and they did not eat garlic, then do not order this. 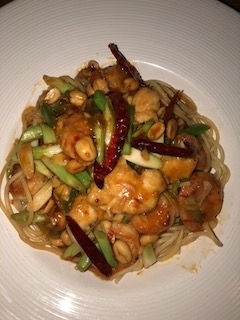 Kung Pao Spaghetti, a twist on a Chinese classic with garlic, scallions, peanuts and hot red chilies, with chicken & shrimp. I loved this dish as well; super fresh meats and the seasonings are just fantastic. 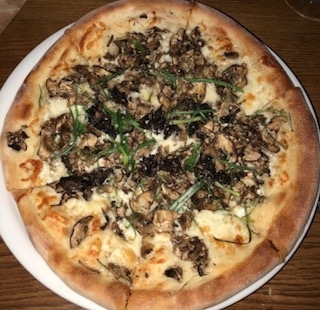 Wild Mushroom, Shaved Cremini, Shiitake, Portobello and white mushrooms with slivered scallions, cracked black pepper, Romano and Mozzarella, finished with Parmesan, and white truffle oil. The flavors of this pie are subtle but truly wonderful, my go to CPK pizza from now on. Margaritas, Fresh Agave Lime, with Milagro Silver Tequila, Fresh Agave Sour, and Fresh Lime. 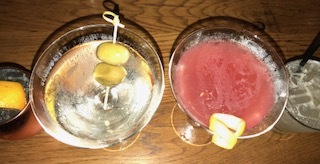 The combination of all of the ingredients is very refreshing and goes down with no problem, my favorite cocktail of the night. Socialite Cosmo, Deep Eddy Ruby Red Grapefruit Vodka, Pavan Liqueur, Cranberry, Agave Sour, Top with Le Grand Courtâge Blanc de Blancs Brut. Another delicious drink, sweet but not too sweet, just right. Tropical Mule, Grey Goose Vodka, Rum Haven Coconut Rum, Ginger Beer, Monin Passion Fruit and Agave Sour, served in a copper mug. Not the biggest fan of this cocktail, but I am sure there are fans of mules out there. Salted caramel pudding, rich caramel pudding, black cocoa cookie crumbs, housemade whipped cream, caramel sauce and natural flaked Maldon sea salt. 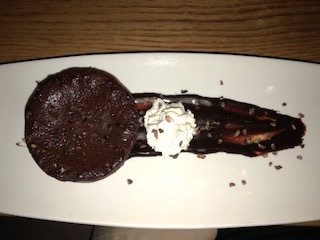 I just can’t say enough about this dessert; you have to eat it all the way down to the bottom. Belgian Chocolate Soufflé Cake, warm chocolate cake served with triple-thick hot fudge, housemade whipped cream and cacao nibs, with Vanilla Häagen-Dazs. So much chocolate, a wonderful way to end my glorious experience. Pumpkin Cheesecake, a creamy pumpkin cheesecake over a layer of classic New York cheesecake, on a buttery graham cracker crust. You won’t want to share! The perfect choice for the fall season, with its rich pumpkin flavor, a great cheesecake. 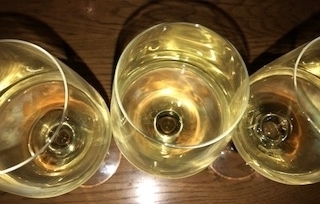 Chardonnay – Clos Du Bois, CA. This wine goes great with the flatbread with its cheesy goodness. Chardonnay – Josh Cellars, CA. I would pair this wine with the lettuce cups; with the shrimp it adds a great creamy balance. Chardonnay – Sonoma–Cutrer, Russian River Ranches, Sonoma Coast. Always my go to wine, I would try this one with the shrimp scampi, it adds a nice touch to the overall garlic flavor. Zinfandel – Sledgehammer, North Coast, CA. You have got to do this wine with the burger, just the right amount of acidity, with it fruit forward berry taste. Red Blend Colby Red CA. I would drink this with the chocolate soufflé, you can, of course, drink it with the steak, myself I like to drink a bold red wine with my desert instead of a desert wine. My waitress; Noelly Briseno, who’s parents are from Michoacán, Mexico, she was raised in Los Angeles. Her parents celebrate day of the dead on Nov. 2, the tradition is digging up ancestors bones and cleaning them and celebrating the dead. Really great being able to share her family stories and her charm and wisdom helped my overall experience. CPK is in a Corner Spot in the newly renovated Westfield mall, it’s the perfect place to people watch. CPK has floor to ceiling windows. The interior is elegant and fun, with yellow chandeliers, a whimsical tile mosaic column, wood crate ceiling, wood floors, a u shaped bar, with lots of Sports screens, a really eclectic interior. An open kitchen, and yellow tiled wood fired pizza oven, adds to the overall excitement, and lets the customers watch what is being created in the kitchen. Music was low, and they played ambient pop. Customers included: kids, families, shoppers, ladies, locals, dates, and singles. CPK has been opened 2 years in February at this location. The whole Westfield Mall has undergone a great remodel, with all of the outdoor common spaces done with wood and organic plants. They did an amazing job, and you can tell because the crowds have gotten very large. The next time your in the mood for casual dining and just can’t come up with the right place try California Pizza Kitchen, for a whole new spin on the place that you are used to.